On March 2nd, Douglas Scrivner, adjunct professor of law at the University of Denver Sturm College of Law and former General Counsel of Accenture, spoke at the 2013 Western Regional Conference of the American Branch of the International Law Association. Mr. Scrivner’s talk, entitled “Human Security, International Law, and Corporate Social Responsibility,” focused on various tools that companies can use to align their business strategies to minimize adverse human impacts related to a company’s operations. 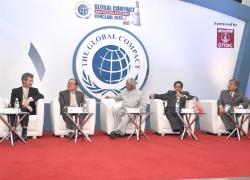 Mr. Scrivner focused on one such tool, the UN Global Compact, which many companies currently utilize to achieve goals in the area of corporate social responsibility. UN Global Compact – Popular With Companies the Whole World Over? The UN Global Compact (Compact) encourages companies to commit to ten principles within their “sphere of influence . . . in the areas of human rights, labor, the environment and anti-corruption.” Companies that choose to participate in the Compact are required to incorporate the Compact’s principles into their business strategies and to communicate their progress in implementing those principles to company stakeholders on an annual basis. While the Compact ultimately aims to benefit societies at large, it also provides a variety of benefits for participating companies. For example, the Compact offers participants a wide variety of resources to help solve common challenges in the areas of sustainability and human rights. Participation in the Compact also enhances a company’s reputation by demonstrating a commitment to the Compact’s principles. Mr. Scrivner noted that companies are more apt to realize the value of company participation in the Compact when shareholders and stakeholders provide the impetus for a company to participate in the Compact. Mr. Scrivner stated that the Compact is not without its opponents. Some companies have voiced concerns that participation in the Compact could have negative impacts on a company’s bottom line. Opponents specifically cite that the Compact’s requirements could change in the future, foisting additional responsibilities onto participants of the initiative. In fact, the Compact originally consisted of only nine principles, and in 2004, added a tenth principle, to combat corruption. Mr. Scrivner countered such criticism by stating that the Compact allows flexibility for each participating company to decide how it will implement the Compact’s principles. Additionally, since the Compact is completely voluntary, participants can withdraw from the Compact altogether if they feel compelled to do so. However, Mr. Scrivner stated that with the growing importance of the Compact, it is prudent for companies to become actively engaged in the Compact to help drive and shape it. With over 10,000 participants in 130 countries, the Compact is the world’s largest voluntary corporate responsibility initiative, and the Compact’s popularity seems to be growing. In 2011, 1,861 companies joined the initiative, a 54% increase of the Compact’s 2010 growth figures. As more companies realize the value of participating in the Compact, the Compact’s ultimate goal of establishing “a set of core values in the areas of human rights, labor standards, the environment and anti-corruption” does not seem too far off. Lincoln Puffer is a second year law student at the University of Denver and a Staff Editor on the Denver Journal of International Law & Policy.